In the past decade, the United States experienced two periods of excessive growth periods followed by two massive collapses: the technology and housing bubbles. Both were caused by illusions of growth and wealth creation: They were built on thin air. As an investor, how can you distinguish between "fake" wealth and the real thing? Where can you earn solid returns without falling victim to bubbles? 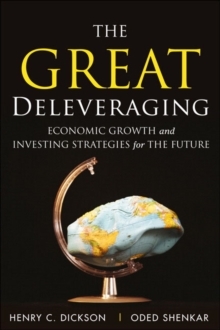 Read The Great Deleveraging and find out. Former Wall Street analyst, strategist and Associate Director of Equity Research Chip Dickson and leading global business scholar Oded Shenkar first identify the policies and characteristics of societies most likely to generate real economic growth and investor wealth. Next, they outline specific lessons learned about bubbles and growth from nearly a century of investment returns. Finally, they identify global markets and sectors poised for high levels of sustainable growth--and make specific investment recommendations for each of them. In the wake of massive debt creation, history's greatest deleveraging is now underway.